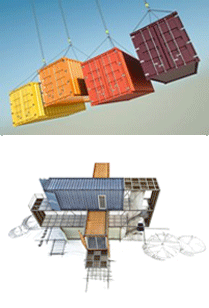 Shipping containers were a relatively simple idea that revolutionized the transportation industry. Malcolm McLean was the man behind it. In the mid-1950's he thought of taking the body from a tractor-trailer and place it fully loaded on a ship, railroad car and even an airplane. reduces the costs and time of unloading the cargo from a truck or a railroad car, loading it into the hull of a ship and reversing the process at the ship's destination. the fully loaded standard containers can carry up to 20 tons. protects the shipments from damage in handling and from thefts. This was the shipping container revolution. At first, not everyone welcomed the idea because as a port operator you needed to invest in some expensive equipment to manipulate the containers on and off ships. The shipping container played a key role in both facilitating and maintaining trade globalization in the 1990s, by lowering transportation and communication costs and permitting, more choices for the location of manufacturing, assembly, and distribution sites throughout the world. A standard shipment from Hong Kong to New York, took 50 days in the 1970's, today it takes only 17 days. The transportation of non-bulk commodities is now dominated by the movement of containers between a wide variety of origins and destinations in world markets. Transport containers are basically of two types, 20 ft long closed metal boxes and 40 ft long closed metal boxes, which together account for the majority of in existence. These containers have become the standard format for moving goods internationally where a sea leg is involved and are increasingly used solely for road and rail legs. In 1999, over 200 million container moves took place across the world maritime ports (container throughput is measured in 20-foot equivalent units [TEUs], representing a box 20 feet long, 8 feet wide, and 8.5 feet high). Dry, insulated, refrigerated, open top are only some of the ISO containers types. Find out here about all the types, configurations and standard sizes of ISO containers. The article reveals what container leasing incurs and when it is a good alternative to container owning and also who are the top ranking container leasing companies. What factors influence the container manufacturing cost and what factors make China the world leading container manufacturer. The world's containers are primarily owned by ocean container carriers and container leasing companies. How much they own and who else is part of the container ownership? Empty containers, fraud, theft and security risks are types of inefficiencies and risks container industry confronts with. Agreements and contracts governing the container liability transfer between buyer, seller and container carriers.